While we were busy running around our iPads with Sonic, we missed an addition to the challenging world of game tile games. Words Play offers you 7 tiles to play with on a 225 square board. 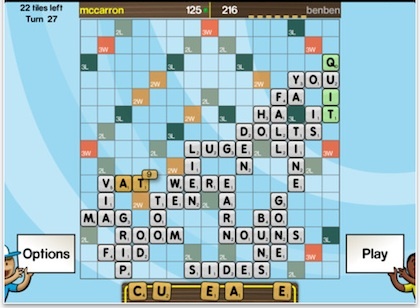 Try to create words that your challengers from around the world (requires a Apple – free – GameCenter account). Laying down tiles on your board, interacts directly your challenger’s iPad or iPhone’s game board. You can actually start a game on your iPhone when a challenge comes in, then jump to the same game on your iPad when you get to the office… er, home. A nice feature of Words Play to keep us all honest is the ability to look words up against a complete dictionary. Not that any of us get overly creative with trying to use up our letter tiles. For the times you don’t want to challenge a human to a game of Words Play, a Ai player is available to install through an in-app purchase.